Ugly media electronics can really ruin the whole look of a room. 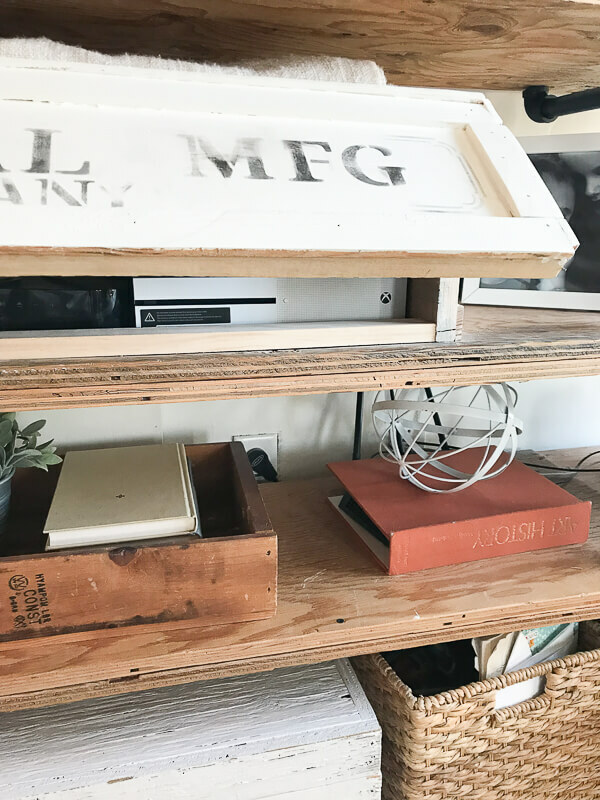 Use these tips to hide ugly electronics in the home. 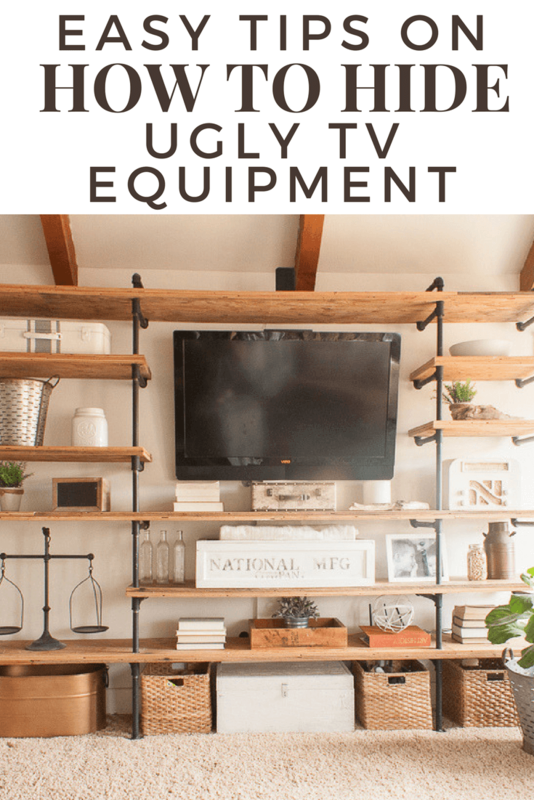 Last month I gave my family room a quick update, and one thing I really wanted to focus on was hiding all the ugly electronic equipment that can be so cumbersome and cluttered. 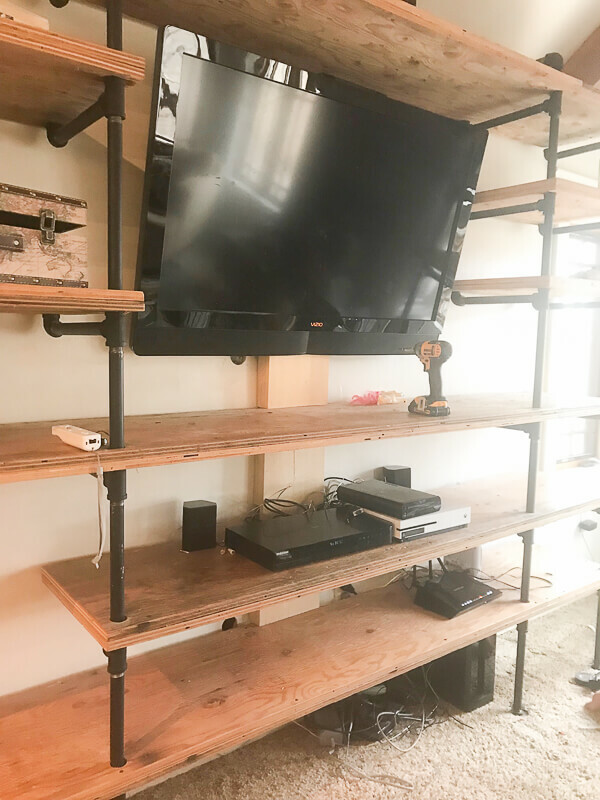 When we built our industrial pipe shelves, I really wanted to come up with a way to conceal and hide our electronics. We had a DVD player, a satelite receiver, and X box, and a WII U, and I hated seeing it all! In addition we also had some surround sound with a receiver for that, and a wireless router, as well as a modem. It was so ugly! I could not decorate the industrial pipe shelves without having all these pieces of electronics. And the cords! Oh my gosh there were so many cords! And, I put up with it for a long time. I just waited and waited, until last month when we decided to repaint the room and give it a quick update. I came up with a few solutions that would fix all out problems. Now, they might not all work for your space, but, they may serve as a jumping off point to help you create your own ideas. The first thing we addressed was how to conceal the wires. Now, Often hiding wires is easy. You can cut a hole in the wall and feed them down through. But, this room proved to be difficult. You see, there was blocking put in between all the studs in the wall, so there was no way to feed the cords down through unless we drilled holes in all the blocks which was out of the question (unless we tore all the drywall off). So, we had to come up with something else. We thought about using those cord holders, that hold all the cords in a plastic cylinder. But, I did not like the look of those. Instead, we decided to build a small channel that the wires could all be fed through until they got to the outlet. You see, with open pipe shelves, there really was no way to conceal them, or hide them. My husband built U shaped pieces out of 1″ thick wood. 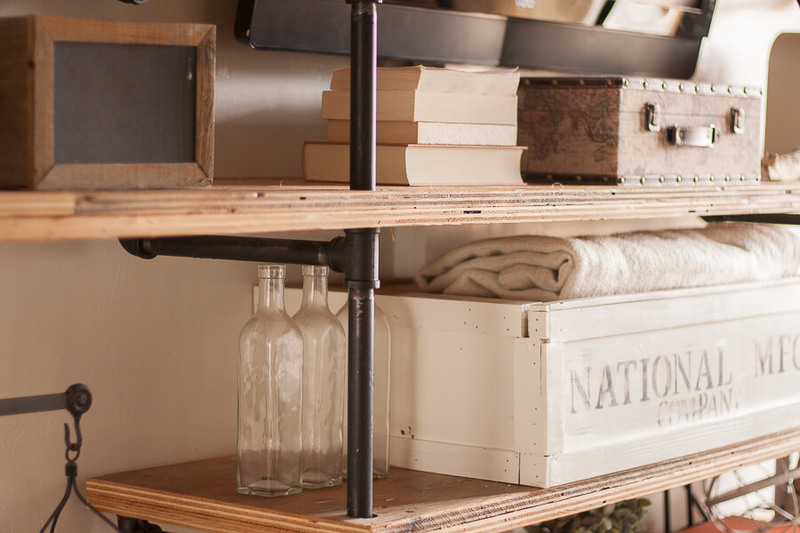 He decided to create one for each shelf, connecting them to the top and the bottom shelf for a seamless look. I painted these the same color as the walls so that they would disappear into the wall. 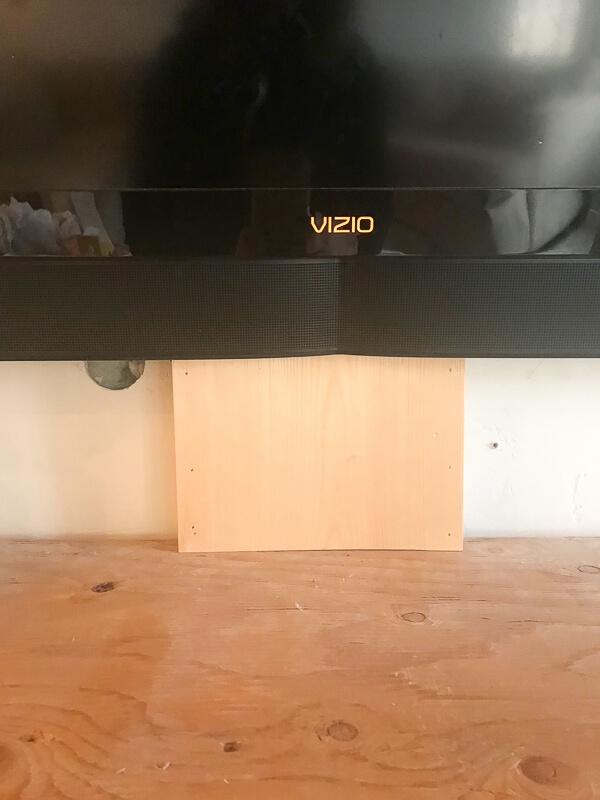 This turned out to be a great way to hide ugly cords! I loved how much cleaner the whole space looked. Now, onto all those media consoles! 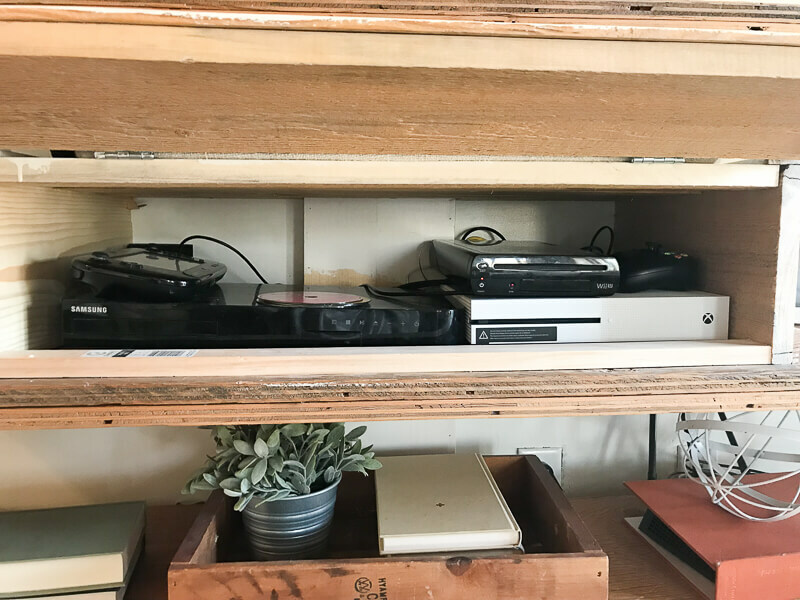 We made sure we consolidated all the consoles and put them all together. That way all the wires were together and all the boxes and receivers were together. You can see in the picture above that there is a bunch of them and its just not pretty! 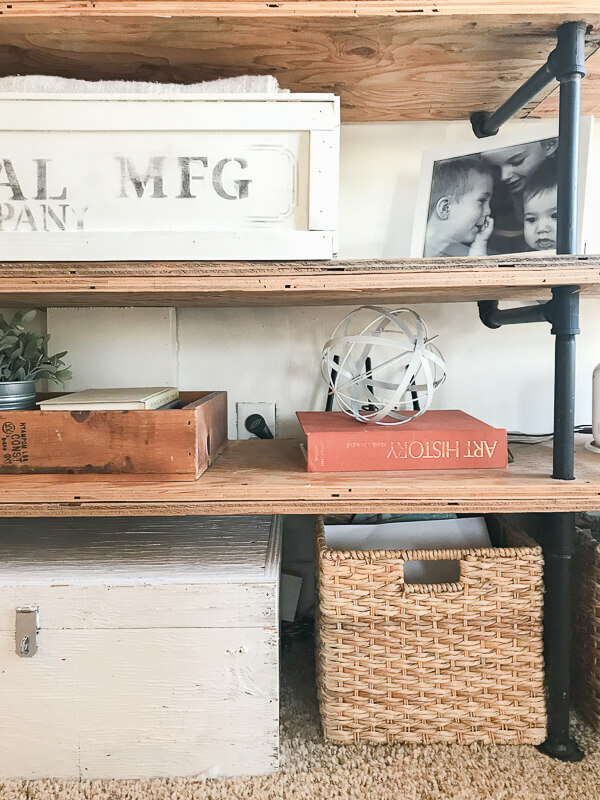 For this project, my husband and I built a “faux” looking crate…without a back! You will see why in a minute. We essentially built a box, but added hinges to the front so that the front piece could be lifted up and down. 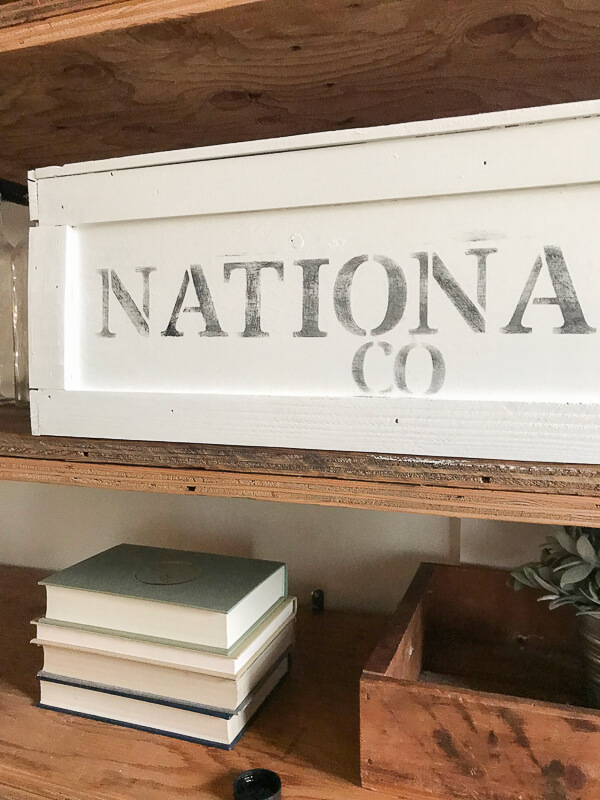 Once the box was built I painted it and added some stenciling to create a shipping type rustic crate. We then slid it onto the shelf, and put all our media consoles in it. We made sure they were all plugged in and had plenty of room. We also wanted to make sure that they had plenty of air circulation. That is why we did not put a back on it. This was they would not get too hot when running. I was so thrilled with this development!! The last item we needed to address was out wireless router. For this, we ended up using the jacket of an old book, which still had some shape and strength to it. We then put the wireless router inside the book jacket, using it to conceal the wireless router. It worked pretty well! 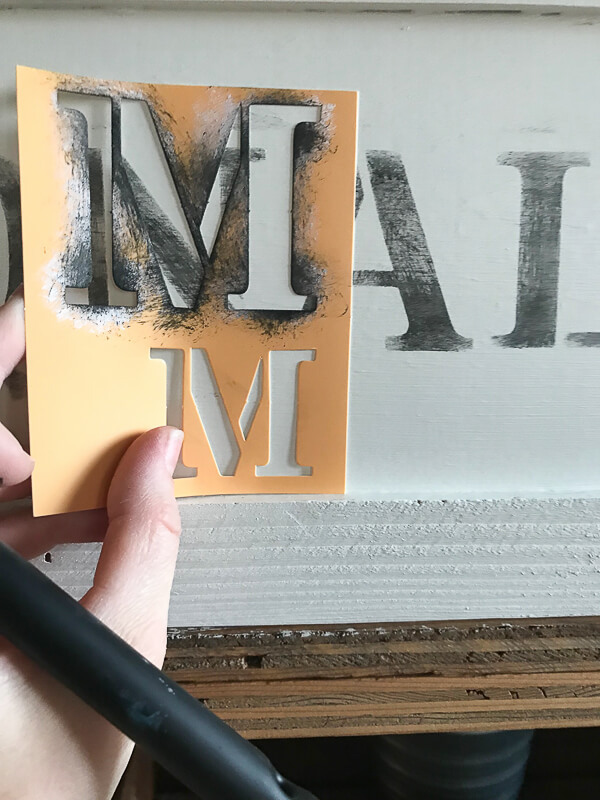 You can see it in the photo below, in the Art History Book jacket….which….I didn’t notice until I was almost done with this post, that it was upside down haha!! Well, we bloggers aren’t perfect afterall! These were just simple things that we did to create a more cohesive look in this space. 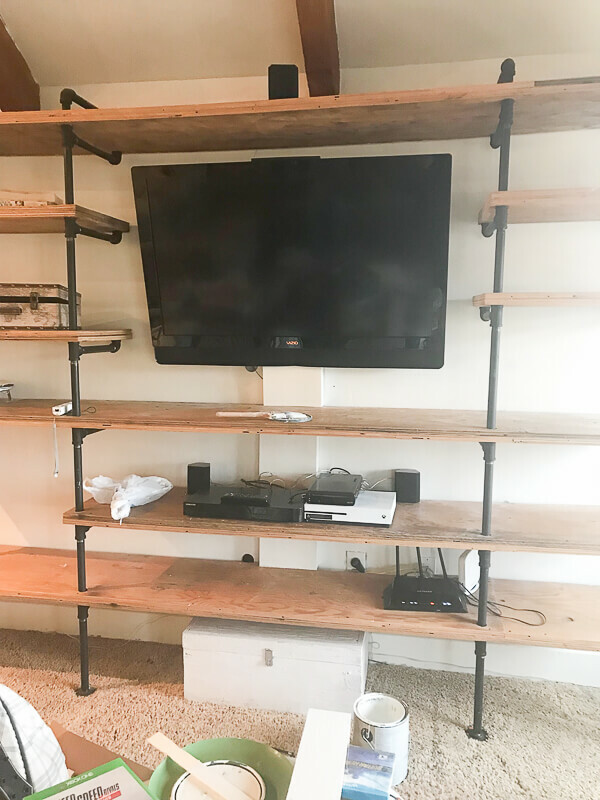 We had to spend some time making sure everything was organized correctly so that all the cords could be channeled together and all the media consoles could be used from one space. I am not that techy, so I had my husband do that part. If it was up to me, I would have gotten rid of many of them! But, its is not. It is up to me to create a beautiful space, though. I feel that when a room is cohesive and organized, I am less stressed and my anxiety is lessened. Plus, it makes the room so pretty! No more ugly electronics!! I call that a win! 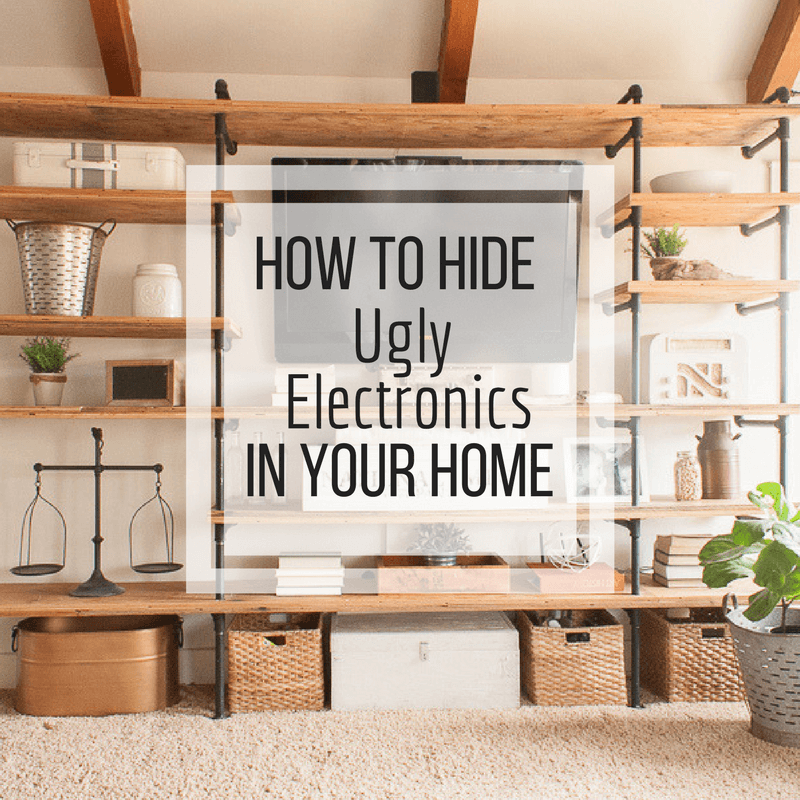 What do you think about hiding ugly electronics? Is it worth it? I think it definitely is, and it can be done so easily without spending a lot of money. Do you have any cool ways you have to hide ugly electronics? I’d love to see! Make sure you save this for later so that you can use it when you need it!! I hope that you have a great day and I am so very grateful that you stop by and visit me here! That was a really nice idea, and you are right us women don’t care too much but kids and men have to have their entertainment. Part of being a mom is seeing our family happy. My kids are grown and i am widowed and sometimes i miss those days. My grandkids come over on holidays and i enjoy our time together.Yes i did get those 504’s but that’s when i went to fb to see. New site seems to be working just fine. Luckily, I never receive an error message. 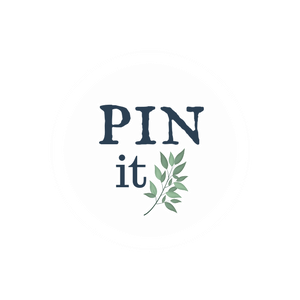 Enjoy all of the ideas, printable and information from the site. Thanks. Oh, I’ve always wanted to hide those boxes, devices and other things but didn’t really have time to do that. Or when I had time, I just forgot. And now you reminded me that I finally have to do something about it. This looks amazing. 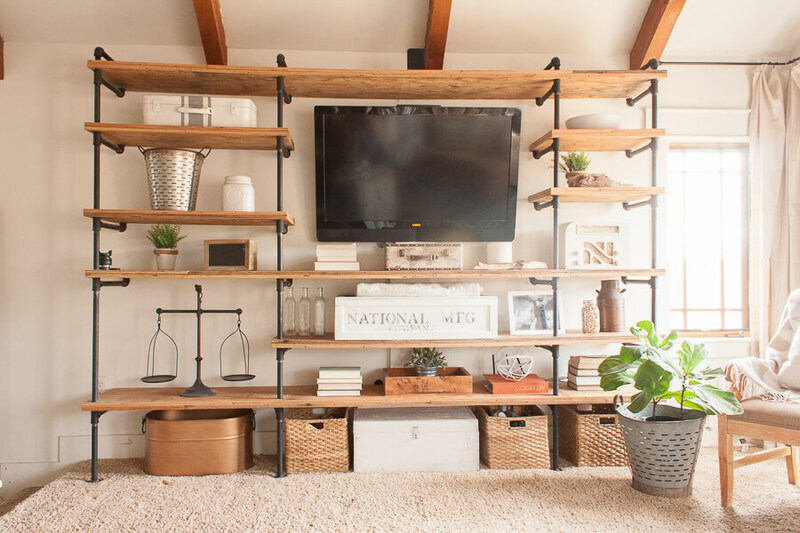 I love the industrial pipe open shelves and the way you hid the electronics. I agree with you that they are an eye sore. The faux shipping crate was so creative. Thanks for sharing at Merry Monday! Hope to see you next week! Great ideas! I have grown blind to all the cables and wires in my living room and in my master bedroom, but in the back of my mind I do want to do something to make them blend in a bit more. Very clever! I might find a similar solution for my own problem of too many cords hanging down behind the TV. Thanks for sharing. I am like you, I hate having cords show. This is a great idea if you have open shelves.